Do you want to improve your course times for two and more seconds? Do you want to make handling and timing easier for you? Do you want to improve your dogs obstacle focus, distance skills, sends and independent performance? Do you want to take lots of stress off your dogs joints? Do you want to make turns more fun for your dog? Then you need to teach cik&cap. Sounds fancy, but it is just another trick. This video offers step by step instructions how to teach it, real life examples, detailed course analysis on where, when and why to use it and some more tricks on how to improve your dogs performance. Download option: the file is 676Mb, estimated download time on 1.024 Mbps line is 1,5-2 hours. Click on the button below to pay and download the video. DVD option: additional 5€ included in the price for shipping and handling. As you probably figured out by now: I love training dogs! And I love it even more when I have a new, not-yet-tested idea. It's funny, because I actually really hate having new phone, computer or car, I hate getting used to new things and reading instructions is what makes me annoyed and nervous in like a second. People that know me always laugh at me to be able to test and develop new methods for years, they know patience, persistence and not giving up are my strongest points - until they see me reading instructions. Give me instructions to follow and I'm giving up in the next second. Give me the dog with the problem and I will solve it. Might take me years, but I will. I love new challenges and I love that every next dog brings me some new ones: Aiken taught me how to motivate hard-to-motivate dogs, Lo taught me how to deal with fears and phobias, Bu taught me how to work with autistic dog with special needs and La... Hm... She showed me how easy it is with problem-free dog (if we don't see hyperactivity and total lack of self-control as a problem, of course 🙂 ). As I needed a problem to solve, something to improve anyway, I came up with that idea of cik&cap turns. She already won World Championships with 6s of advantage before that, so no, we didn't need it. But we loved it and with every next dog, every next student and every next course that I run, I love it even more, I see even more advantage in it and even more positive side-effects. Cik&cap turns are born as a trick, that's where the name comes from: cik-cak/zig-zag was how I called figure 8 between my legs trick. And then simply generalized it for sending the dog to wrap other objects, eventually jump wings and then eventually jump wings with a bar inbetween - low first, and then higher&higher. 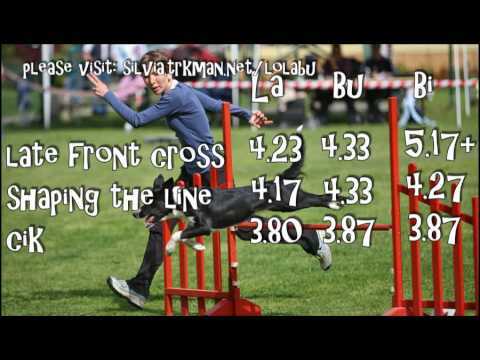 Very easy, elegant way to cut off 2 to 5s off your course times, depending on how good or not your dog is naturally turning and how long or not he is jumping when jumping in extension. Yeah, most people think I gain most with running contacts, but as there are maximum two occasions to do running contacts per course (none in jumpers), that's not really true. You can gain the most on turns. And it's not just about the turns. At the same time you are training for perfect turns, you are training sends, distance skills, independence, commitment and obstacle focus and you're making turns and agility as such way more fun for the dog. Especially if you're just starting, beginnings can be somewhat frustrating for both the dog and the handler as they both have so much more to learn - but knowing cik&cap makes it more fun for both, it allows the dog to run and have fun right from the start and gives the handler more time to think about where and how to cross etc. Handling and timing definitely gets MUCH easier with cik&cap, it allows you to get perfect turns even when you don't happen to be on a perfect spot at the perfect moment. And probably most importantly: as it allows the dog to know all the time where he is going next, so that he has time to adjust his speed and prepare for the turn, it takes lots of stress off your dog's joints. It always hurts me to see dogs landing in wrong direction, having to absorb all the momentum to stop and turn and then speed up again, sometimes even falling on their shoulders... NOT good! Cik&cap allows your dog to always land with front paws turned in the right direction, so the momentum from the landing is used for speeding up again. So yes, cik&cap is definitely The trick that you want to teach to every agility dog. Have fun! I am hoping that going back to basics and using cik & cap will teach him how to wrap his body around the upright and make our runs much smoother. My question is this. He is only at 4″ at the moment, although he is probably ready to move up to 8″ very soon. In competition he jumps 20″ (we have very low heights in Australia- he is 21″ tall). He only has a few more competitions for the year, and I will do most of the retraining over our summer/christmas break. In competition, do I ask him for cik & cap, or will that undo our good work if he doesn’t actually understand it and goes wide? Should I just let him go wide as he usually does, and wait until the break to get him closer to competition height in training and then start asking for it at a trial? Since it’s actually not so much retraining as additional training, you can continue to trial normally, just don’t use the new cues until he can do it on full height. Cik&cap actually doesn’t mean to come back, it only tells where to land (close to the wing with front feet turned in one or another direction) and what happens next depends on the next cue. And how to land there depends on their structure, some can really wrap it and those with less flexible backs will need to add some more extra strides and then throw hips over the bar, but yes, you certainyl want them to land close and turned already. I have a question about our cik&cap. I am sometimes doubting if Sum his cik&cap are tight enough 😉 I started training cik & cap at 6 months (he is now 13months), to have a lot of fun and build it up really gradually, so that in the end we will have amazing turns 😀 That’s why I want to ask you if these cik&caps are tight enough (don’t want to spoil it now 😉 ). Great -- looks tight enough to me! Add speedier approaches and various angles before going up of course. Hi Silvia, I have another question about cik & cap. How much you train the different excercises for cik&cap? If you do figure 8 for example, do you do it just for one session and if that goes well then continue to other set ups? I have the idear that I might be doing the same excercise for to long, looks like Sum knows what is going to happen xD smart dog. So should I continue to the next excersise sooner? For example one session on normal figure 8 and then continue the second session moving one jump to another angle or add an tunnel or whatever. Oh, I never spend a whole session on just figure 8s 🙂 -- way too boring! And I rarely set an isolated sequence for my youngsters in a first place -- I just use a set up I have for my other dogs and do something less advanced on that same set up -- so our figure 8s always look different -- and we never repeat anything more as twice if it went well. You definitely need new cue for new behavior yes. Use left&right for extension jumping and new cues for collection jumping. Only use them for collection, but that doesn’t necessarily mean full, closed wrap of course -- but any time you need collection. Ok thank you for the reply. Lots to work on! Hi Silvia! I’m on my third dog teaching your turns and we’re just starting to add bars as she’s 7 1/2 months old now. I’m hoping you can advise me on how to go about fixing her bar dropping issue? She rarely actually hits the bar itself when working sends and commitment on wraps but rather turns so quickly around the jump standard that she hits the standard with her shoulder/rib area, causing the bar to fall. She is my first very fast and intense dog who is less prone to thinking when running but we are working on her thinking skills as well as further body awareness. On that note, on straight sends she will also sometimes just run and not pay much attention to the bar. I quickly moved the bar to 6 inches in hopes that the height will cause her to take more notice of it when running straight (she is about 18 inches tall right now), sometimes it helps but not always. She seems a bit like you describe Bi in that she doesn’t correlate negative responses with her actions (stopping the fun to fix the bar, etc). I’m finding some success in making the bar appear more visually solid by draping a towel over it, but not sure if that’s a good fix or not at this point. She just loves to go really fast and gets more excited by my action/motion. Any suggestions would be very appreciated. Thank you! Yes, you can use towels and buckets and shoes and similar on bars to get more attention to them. I also like pool noodles for bars 🙂 Knocking over a stanchion usually goes away with height, so I wouldn’t worry about it too much. You can set a cone or similar to the spot where she wants to land that makes her knock the stanchion. It’s often because they land on its feet, so you can prevent that with a cone. I don’t know is this the right place to ask? But I try If you can answer. I just bought a video and I’m starting CikCap training. At the same time I’m also practicing running contacts. Now I’m wondering CikCap and RC turning cues, how they relate to each other. I have cues for soft and extreme turns in contacts. Can RC extreme turns cues (which I allready have chosen) be same than Cik Cap turning cues? And can I also use those (RC cues or CikCap cues, different or same cue) when I turn dog from straight tunnel? Then I notisen you also have right and left cue, which you use in jumps, when you want soft turn in jumps. Can that be same cue than in RC soft turns? I have the same soft turns cues for all obstacles yes and I have different hard turns cues for jumps vs. DW&tunnel as I want cik&cap to really always mean to look for something to wrap. BUt if it’s much easier for you, you could as well use the same cues, some people do so. Thank You! This helps a lot. I take different cues to cik&cap and use those I have in other situations.